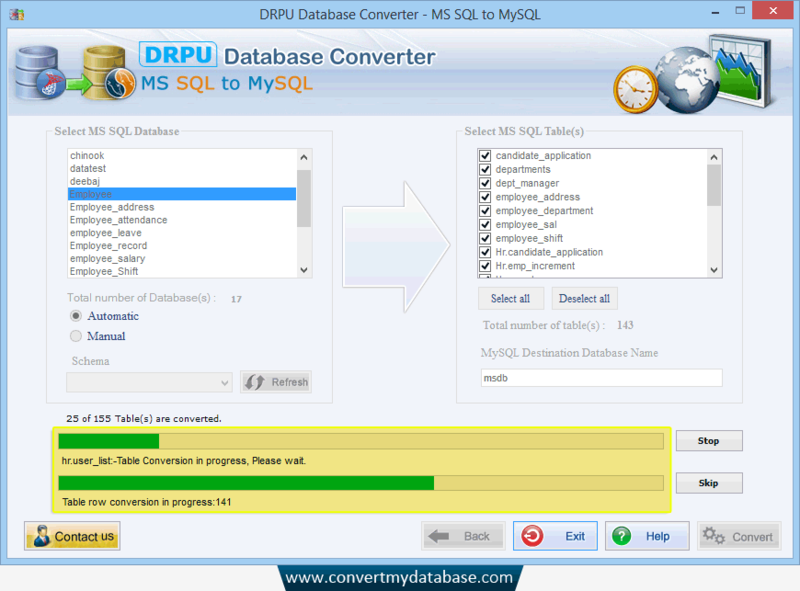 MS SQL to MySQL Database Converter is a program to convert database records created in MS SQL into MySQL database. Database migration tool support tables, attributes, key constraints and null value constraints of MS SQL database according to destination database during conversion and maintains database integrity. Software provide option to convert database by selecting schema items manually. Software converts views, stored procedures, indexes with all necessary attributes. If you want to convert only table structure then, you can select option 'convert table definitions' only. Convert MS SQL database records into MySQL database records. Provide option to convert views, indexes and stored procedures. Saves time by automatically or manually converting single or multiple database records. All major versions of MS SQL and MySQL database formats are easily supported by MS SQL to MySQL Database Converter. Safe data conversion and database integrity : Database converter for MS SQL to MySQL supports all My SQL and Microsoft SQL Server data types, primary keys, table structure (including rows and columns) and null value constraints etc and thus maintains database integrity. Saving options for migrated database records : Database conversion utility provides the option to user either to save the converted MySQL data at user specified new location or overwrite the MySQL database records into existing MS SQL records. Full Unicode architecture support : Database migration software supports Unicode architecture character set and provides database conversion from MS SQL database format to MySQL database format by avoiding database redundancy.